Number of blocks – n/a – it’s a whole cloth. Fabric – Plain white cotton plus Liberty Stile F8 bundle. Threads – Aurifil 50wt really white, not sure of the number, all the way through. Batting – Cheap 4oz polyester. Oh, lovely! 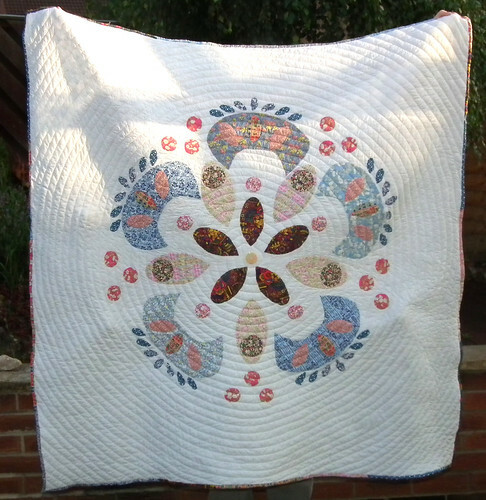 That circular quilting adds a lot of depth. Good Luck, it’s a smasher! it’s really very pretty… love it. Just gorgeous, Kerry! Love your spiral quilting too!